First, let me just say that reading the book is totally worth it, even if you don’t do the program. You will learn a ton about food and how it affects your body, even without your knowledge. So what exactly is the Whole30? It is a 30-day elimination diet (as in food your consume on a daily basis for survival, not weight loss thing) made to reduce bodily inflammation caused by food. At the end of the 30 days, you are told how to reintroduce foods to identify food sensitivities and intolerances. In this process, you learn how to eat for optimal health. Because it is an elimination diet, there are a lot of foods excluded from it for the 30 days. The purpose is to clear your system from all contaminants before checking for reactions (after the 30 days). So what are some of the benefits of doing Whole30? Naturally low in sugar (so you can break your addiction if you have one). Easy to eat within your body’s needed calories (though you don’t count them on this plan). Reduces systematic inflammation in the body. This can decrease bloating, soreness, and a number of other ailments. Emphasizes whole foods including veggies, fruits, nuts, and meat. Many people see weight loss (though it is not the purpose of the plan *see above). Many people report better sleep. Many people report increase energy and better concentration. It can help reduce or eliminate digestive issues caused by food intolerance. It is very strict – Meat, veggies, fruits, and nuts only. No grains, dairy, legumes, alcohol, or sugar. There is no room for any treats during the 30 days. You stay on plan or you start over at day 1. It is very difficult to eat on-the-go, whether traveling or just out to a restaurant. The plan calls for 3 square meals, no snacking, and that isn’t always possible in a busy schedule. So luckily my list of downsides is pretty short with regards to Whole30. It really is a great plan to help kickstart healthy eating. They even encourage you to do it regularly at shorter intervals when you feel yourself slipping (like a Whole7 1 week detox perhaps?). It is also a useful tool to pinpoint food reactions that you might not know you have. When you clean up your diet so much and then add something back in (don’t worry, they give you instructions on how to do this also), you will notice a reaction more than you would if you ate it all the time. So, what is my decision. I will not be doing the Whole30. Why not you might ask? Well, I was reading a ton of blogs, both positive and negative, on the program and a lot of the posts just made me sad. Especially the people who did really well and we happy with the program! I just was sad for them when they said they had to skip out on enjoying food sometimes. You see, food is not just fuel. It is also a part of our culture and social nature. Almost all social gatherings, holidays, etc. center around food. While that maybe isn’t the best thing for our waistlines, it is good for our mental health. Being together, enjoying good food together, is part of what makes people special. I don’t want to miss out just because I’m on some meal plan. Very few. Not just a few (that is the 80/20 area where I start to slip) but very few. So that is the goal as of the moment. Will I feel deprived and miserable? No! I’ll be able to have a treat whenever it is important to me to have it. Most of the time though, I’ll be adhering to the strict rules of Whole30, because that is what works for me. One last side note before signing off. A lot of people criticize Whole30 for eschewing grains and dairy (or any whole food groups in general). If you have not read any scientifically backed literature on the subject, I encourage you to do so. Books like It Starts With Food, Practical Paleo, The Paleo Solution, and Primal Blueprint (book review to come!) really delve into this subject thoroughly and use science and clinical studies to back their information. Finally, Whole30 is an elimination diet to help you identify food intolerances and is not a weight loss crash diet. For me personally, I know that I have food intolerances from previous similar experiments with my own diet. Eating a Whole30 diet most of the time keeps me feeling my best, healthiest me. You might not know you have intolerances until you try something similar. Have you ever tried the Whole30? How was your experience? 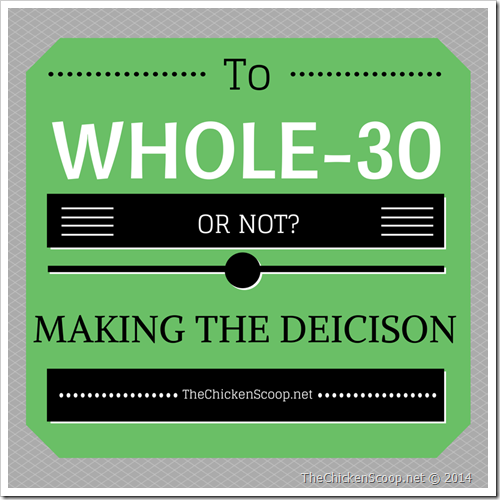 6 comments to Making the Decision: Whole30 or Not? I did a Whole30 and it was a huge eye opener for me. It helped me learn to eat vegetables (silly, I know), and understand meal prepping and how important it is to take the time to enjoy your food. Sit back and relax while eating, etc. However, on the other hand, it made me a bit crazy.. in that I became super judgmental and freaked out about food. I wrote about it here (www.winetoweightlifting.com/crossfit-paleo-orthorexia).. but overall I agree with the foundation of it and know its so valuable to so many people. Def respect your decision not to do it and the reasons behind it, and good luck on what you are trying to achieve! I forgot that one! I didn’t want to become food obsessed! I didn’t want to constantly worry about my next meal and if it would be compliant. I can’t deal with that!! I agree. I think any plan that says you can NOT eat something, isn’t right and I think society and culture plays into that a lot. Food is celebration. 1) I already know what foods I react to. 2) I don’t need to make myself miserable for no reason. You know I’ll be roasting marshmallows on my camping trip this weekend! I’ll just keep it in better moderation that I once would have! Yeah we definitely can’t have THAT! All I can think about is no marshmallows while camping this weekend. Sad, so sad. So I just can’t. LoL!